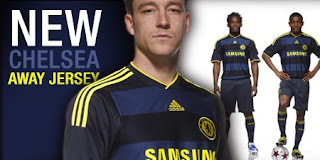 This just in: The brand-spanking new Chelsea Football Club 09/10 Away Soccer Kits are here! It's a SuperCool hooped dark navy & neon yellow shirt with a totally unique collar design. Includes embroidered Chelsea team badge over your heart, and adidas logo at center chest, with screened SAMSUNG sponsor logo at front; and yes, it's made with ClimaCool® adidas' advanced material engineered to reduce heat and moisture build-up, allowing increased comfort and performance, keeping you feeling fresh no matter how long the big Blues match goes on.